This is a guest post by Zocco who writes about discount deals at coupons blog where he regularly shares TRX discount coupons and ereleases coupon codes. Check out his latest blog post where he covers trx training coupon code and ereleases coupon code. It’s never too soon to find a sponsor for your blog. By getting a sponsor, or by selling an advertising banner without tying up with Google Adsense keeps the revenue where it belongs; with you. Note that when you sign up a sponsor, you must provide them as much value as you can. This means you need to put yourself out to deliver results on the campaign. Advertise the sponsorship to your readers via posts, newsletters, lists, or by positioning it high on your site and so on. Your chance of renewed sponsorship depends on how much traffic you can deliver to your sponsor. If your blog is small, there’s no sense in approaching large companies. Try approaching small online retailers, or product sites and companies that specialize in your niche. Try for as many as you can; you will get a few responses and a few successes that you can build up. Think carefully when you target potential advertisers and sponsors; see if the topics you blog about have relevance to the companies you shortlist. Come up with a list of companies who’ll benefit from your blog’s niche. If you’re not sure whom to approach for sponsorship, check out other blogs in your niche and study their advertisers and sponsors. It’s possible that other blogs in your niche are running similar campaigns. You will learn a lot by following their progress. I used this trick to get advertisers for my TRX coupons and eReleases discounts blog. This tricks works for sure friends. I must say, use this! Email potential sponsors and enquiring if they’ll advertise with you is the basic aspect of selling. However, you can make this process more effective by identifying your blog’s USP. What do you have that sponsors might be interested in? A loyal community of core readers? A great deal of search engine traffic for specific keywords relevant to the sponsor? A research-oriented audience checking on future purchases? Do your homework wisely; find a reason for your potential sponsor or advertiser to align their brand with yours. If you are unable to attract a sponsor, think of running your own campaign. Select an aspect of your blog that you can use to drive traffic. This can be a successful post series, a blog category, or even users’ subscribe page. Develop banner or button ads based on this and drive traffic to it. The plus point of this exercise is that you’ll be able to test conversion rates from different standpoints. Understand your blog’s advertising potential by running a heat map test. Tying up with BuySellAds, AdvertiseSpace, OIOPublisher and other such middle man agencies could also be considered as an effective method of attracting sponsors to your blog. 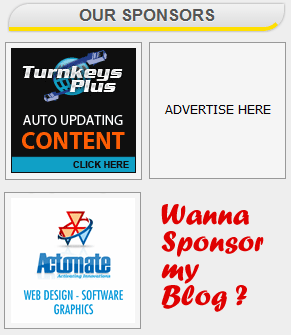 Remember, DailyBlogging is also open to sponsors, so hit the ‘Advertise Here‘ banner on the sidebar if you want to advertise your product or service. What other techniques do you use to attract sponsors on your blog ? I write about discount deals on a blog and release coupon codes from time to time. Thanks for sharing such a wonderful post! Hi Zocco, thanks for sharing these tips and great ideas that for anyone looking for a sponsor. Nice blog. It will help to get sponsor for my blog. Thanks for sharing. The 5 you mentioned are indeed helpful ways of finding income for your blog. They are very useful as I too used most of these techniques in the past. Cool post Zocco! 1st and 3rd points must be given focus! Great ideas. With these ideas, I am sure I can find some sponsors for my blog! Great information dude. Loved it.Keep it up. I would also suggest to offer discounts in the long run for loyalty from the advertiser. Just going above and beyond, in trying to get exposure for that advertiser will show that you really do care for them. i think joining networks like bsa, puxee etc. is a gud idea .. i m not sure how mailing would help as i never tried it..
Hi thanks this is what I need, sometime I’ve a difficulty to find a sponsor. I think I’ll follow your advice. Thanks for the useful advice as it could be very much beneficial for newbie like me. Thanks for Special Tips. It will help a Newbie to get Sponsors for his/her Blog. nice article for those who are looking for sponsor for there blog. definitely helped me a lot. I know the difficulty to find the Sponsor.But if the blog attained the threshold traffic then Sponsors will contact us! Excellent tips, however I think a new blog first need to be developed so that it starts getting search engine traffic then only one can get sponsors. Its one of the toughest task of blogging . But yes, if you have a quality traffic no one can stop from sponsers offers filling the admin email. Good article. Also, even if you are running a small site , you can still approach big companies. Thanks for this topic… I’ll make sure to follow your recommendations. I really need a sponsor for my blogs. I’m new in the blog world and am just starting to research potential sponsors. The one tip I would add to the list is “Content is King.” You need to engage readers — and draw them back time and time again — by posting posts that offer them what they need and/or are looking for. And you need to post substantive posts frequently — this isn’t facebook. Thanks for the great, useful post. I will definitely follow your advice. Thanks for sharing your ideas about finding a sponsor for my blog! Some say that it’s easy to get sponsors for your blog if you write good, original content. However, it’s not easy! Good tips in your post — I’m a believer in the free/discounted trial. Its a wonderful post. I am looking for sponsors from some time and now, I think it will be little easy for me to look for sponsor. Thanks for the post. how will sponsorship be handled? It is good informative post on how to get sponsors. I think simple way to start with is using ads on the blogs. I think we need to have a commendable traffic. Then only sponsors will come. However, i targeting a small local sponsers will be easier. Thanks for sharing the info.